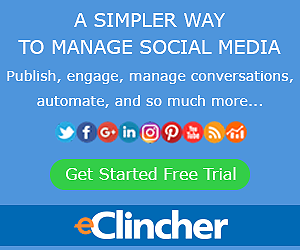 eClincher Review: Is this a Good Social Media Management Tool for you? Over the last decade or so, social media has grown to be a major component of most marketing plans. Studies show many people who are able to make buying decisions spend quite a bit of their time on social media networks, so it makes it an important place for businesses to present their solutions. Unfortunately, if you try to engage on each platform without automation tools, it might just dominate your whole life–that’s why it’s important to look at alternatives like eClincher. If you decide at any point you want to skip the remainder of the review and TRY ECLINCHER OUT FOR YOURSELF, you can CLICK HERE TO CREATE YOUR FREE ECLINCHER ACCOUNT. 2 How Does eClincher Work? 3 How Do I Get Started with eClincher? 4 Who is eClincher For? eClincher is a social media management and automation tool. It was created by Gilad Salamander in 2010 to offer a better social media management solution than what was out. He saw that businesses who want to engage on social media were spending 10 hours or more per week to do so, when their time could be spent on social media more efficiently if there was a good software solution. As a result, he created eClincher, to squeeze or “clinch” maximum results out of social media, and has since continued to improve it to better suit the needs of his customers. Users can manage all of their compatible social media platforms without logging off and logging onto each one individually. Instead, they’d log onto eClincher where they can manage their inbox, automate posts, track hashtags, monitor brand mentions, respond to comments, and more. Let’s imagine you have more than one social media account, and you know your target audience is highly engaged on each one. You know that social media algorithms measure account activity and the engagement of others with your posts, so you decide to post engaging content regularly. You decide to post 3-5 times per day on each of your social media platforms during your audience’s peak times: 0900 AM, 1100 AM, and 7PM. You follow thru with your goal, and begin logging onto Facebook at 9, opening another tab and logging onto Twitter, opening another tab and logging onto Instagram, and continue with each social media platform. You have all of your posts saved onto a Google doc, so you simply copy and paste onto each platform and publish. With eClincher, you can schedule posts to your social media profile to go out at the times you want (or the times your audience is most active). With the queues feature, you can load each social profile with content that will publish over a span of time. You can also recycle old content automatically by enabling this feature within eClincher. It doesn’t help to solely publish interesting material. It’s also important to respond to comments and messages, and build a relationship with those who are engaging with you. eClincher enables you to engage with users of different social media platforms from one interface. When social media users send you messages to your profile inbox, rather than logging onto to check and respond, you can simply respond to them thru eClincher. It really helps to base your marketing strategy around successful results, but, how do you measure results without some form of analytics? eClincher offers detailed analytics to help you evaluate the results of your social media efforts, and to help you decide how to continue your social media strategy as a result. Graphic design is almost mandatory for social media. Unfortunately, many social media automation tools don’t cater to that. Instead, they require that you design your posts in one platform, then upload them into the social media tool which is incredible inefficient. With eClincher, it’s integrated with Canva, so you can design your social media posts and schedule them in one platform. The integration with pocket enables eClincher users to browse the internet, save interesting articles and images for curation, and to schedule them in eClincher. The CEO mentioned in his interview that the eClincher team will be working to make the process of curating content from across the web onto social media even easier in ongoing updates, so the platform is going to continue building more robust options! How Do I Get Started with eClincher? First, you’d VISIT THE ECLINCHER WEBSITE HERE. eClincher generously offers a 14-day free trial (without asking for billing info) where you’d be able to play around with the features to see how you’d use them in your business. During the 14 days, you can schedule posts to your profile, respond to inbox messages, track brand mentions, evaluate the analytics, and more to decide if eClincher is a good fit for you. Once the trial is over, you won’t be able to continue using the features, but if you noticed the time savings and cost savings of eClincher, then you can UPGRADE TO AN ECLINCHER SUBSCRIPTION. eClincher offers tutorials to help you to use their social media tool. They also offer articles to help others with social media. eClincher offers live chat support only. Here’s a roundup of reviews I’ve found on eClincher from all over the internet. I’ve compiled them so you can have realistic expectations of the strengths and weaknesses of the tool, and evaluate accurately whether it’s a good fit for you. Out of 146 reviews on Go2Crowd, eClincher recieved an average of 4.9 stars. Negative feedback for eClincher was uncommon, so these are constructive comments from customers on what they would like to see improve. I run a social media marketing business, and I need to access all my client accounts in one dashboard. eClincher does just that. Plus individual clients are separated, with all their social media channels grouped under client name. What I love the most though is eClincher’s social inbox, here I receive instantaneous responses for all my client accounts, enabling me to respond accordingly, and prevent bad pr disasters. Previously I used Buffer, but found eClincher more affordable, and their tech support on -point. Literally got answers to any of my questions in minutes. There is no direct to instagram option and there’s the occassional bug where I won’t be able to access the program for a day especially on the mobile app. Use the calendar feature to keep track and avoid double posts. Definitely explore the gif and stock photo options as well! Keeping track of several social media platforms and keeping your followers updated with relevant content without spending hours on this. Overall, eClincher is a great social media management tool. I can see how it saves time in comparison to competitors. I’ve used many of the competitors’ solutions. Some focus on one social media platform, and others that offer similar social media platform integrations offer less features. If you want to efficiently manage your social media platforms, I highly recommend you to SIGN UP FOR THE 14-DAY FREE TRIAL, and try it out for yourself! Kicksta – An Instagram automation tool. CHECK OUT KICKSTA HERE. Tailwind – A Pinterest and Instagram automation tool. Tailwind enables more collaboration with Pinterest influencers thru the tribes, so it still has a competitive advantage for Pinterest marketers. CHECK OUT TAILWIND or read my full Tailwind Review. Hoostsuite – The most relevant alternative to eClincher. They offer automatic scheduling of posts, inbox integration, and so on, but there’s less features and the pricing structure makes it more expensive for the comparable features. CHECK OUT HOOTSUITE HERE. Integrates with Facebook, Yelp, Google my Business, Twitter, LinkedIn, Instagram, Pinterest, Canva, Pocket, and more! Wow thanks for this tip. I think is a very helpful, a huge time saver. I love the fact that it offers 14 day trial to test it out. This is definitely a big help for me. I didn’t know there was such a tool to manage social media accounts the way you described. I think it’s awesome. Thanks for sharing. This looks like a very promising automation tool for your social media. Thank you for the information Tiffany. I have heard some good things about hootsuite, but it looks like eclincher can compete in term of functionality. I am still new to the world of internet marketing so I may need support service depending how easy it is to use. I’ve used Hoostsuite and it’s also a good tool, but eClincher has more features. Since you’re new to internet marketing, it may be a learning curve, but they give you the 14-day free trial to try it out, and see. You’re welcome Marita! I’d love to hear your experience with it.